Cocoon is the bed in a box offering from mattress industry giant Sealy. 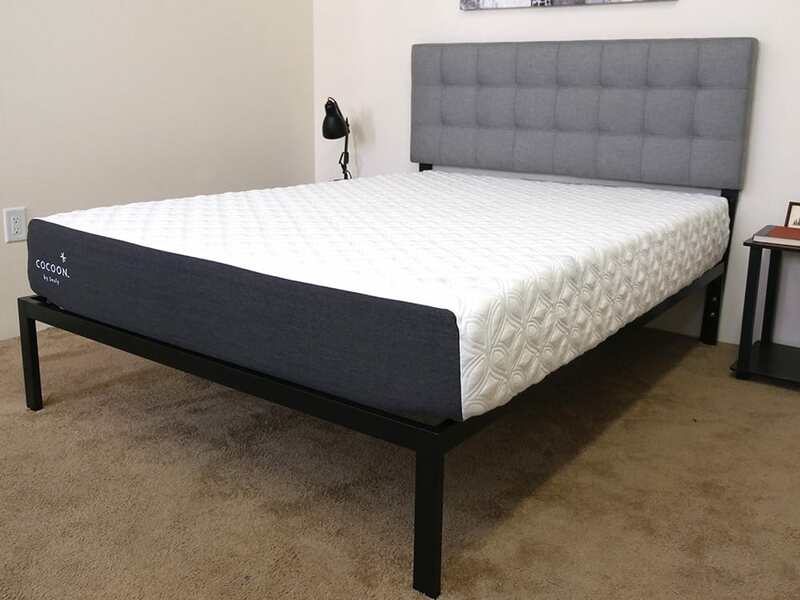 This all foam mattress comes in two different firmness levels and is delivered directly to your door. 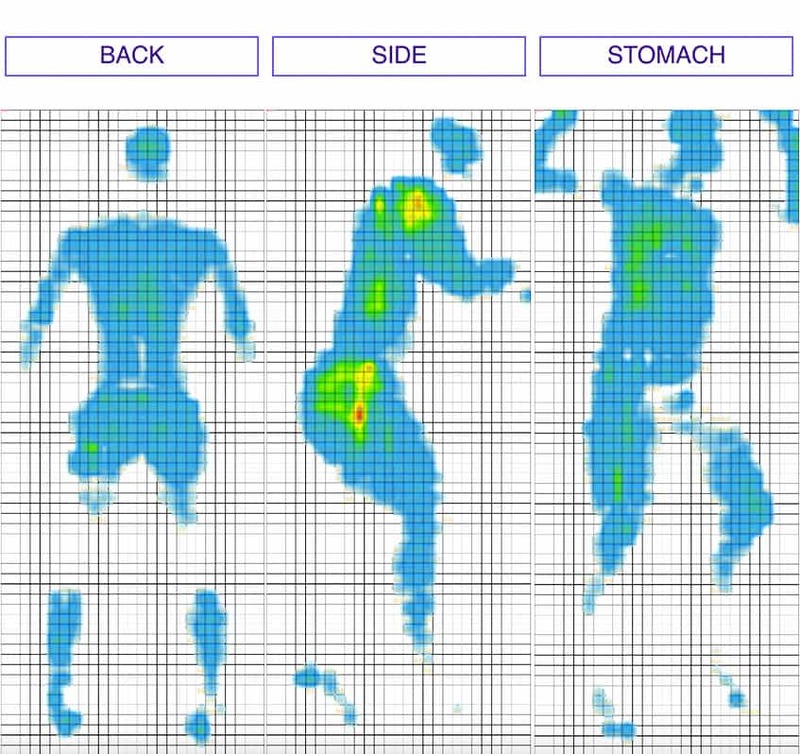 Interested in learning if the Cocoon is right for you? Read on for my full Cocoon mattress review! 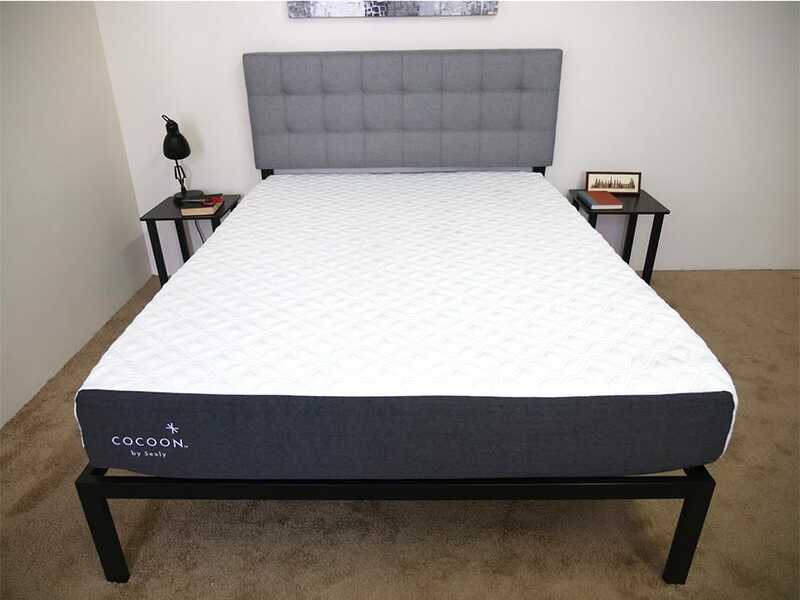 The Cocoon is Sealy’s all-foam mattress that offers a memory foam comfort layer to provide a contouring feeling as you sink in for pressure relief. Enjoy $100 off your order with the code SLEEPOPOLIS! 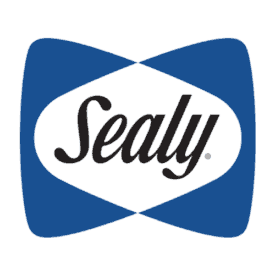 Sealy started making mattresses over 100 years ago when the founder would fill them with cotton (luckily, materials have improved since then). The company has a wide range of models and is probably best known for their Posturepedic technology. 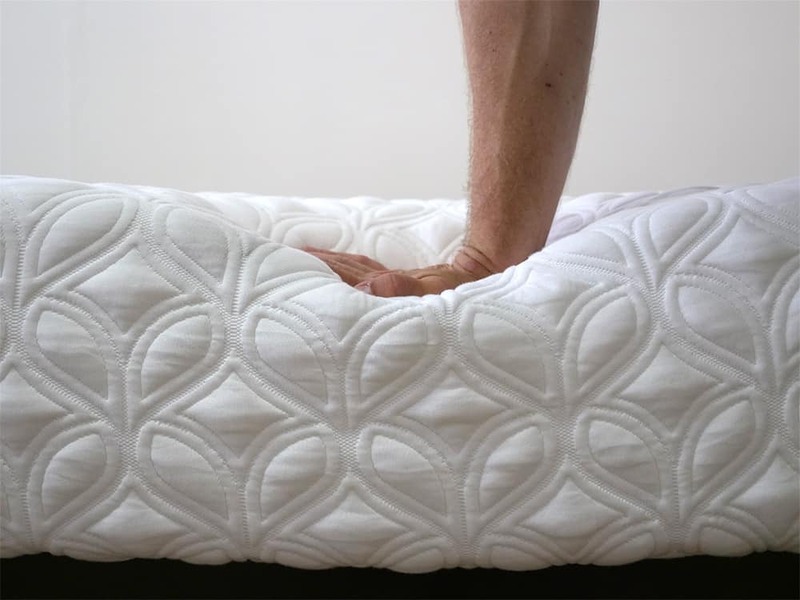 To get the Cocoon to its current version, Sealy went through two years of research and development and over 100 prototypes before entering the bed in a box market in 2016. A big reason why I was so excited to get a look at this mattress is Sealy’s over 130 years of experience and the intense R&D phase, so let’s jump in! Sealy offers the Cocoon in both soft and firm versions, in order to cater to a wider variety of sleeping preferences. Today I take a look at the firm version of the mattress but will provide some basic information regarding the construction of the soft as well. Cover – The cover is made of 100% polyester and has a very soft feel to it. I found it to be pretty breathable, which is important for helping to keep the mattress from trapping heat. When I pulled on the cover a bit it snapped back into shape pretty quickly, so it shouldn’t bunch up much when adjusting position during the night. It’s also thin enough that it doesn’t interfere with the feel of the top layer of foam. I should point out that there is an alternative model of this cover, called the Chill mattress, that uses phase change materials help with temperature regulation. Please note that there is no difference in the foam layers between the Classic and Chill versions of the Cocoon as the only change is in the cover. The Cocoon Chill is a bit more expensive than the Classic ($150 more at the same size), but if you generally have issues sleeping too hot, you may want to take a look at it. Comfort Layer – The Cocoon Classic Firm’s comfort layer consists of 2 inches of memory foam. Memory foam is known for its ability to contour to the body and provide pressure relief. Sealy doesn’t disclose the densities of the foam used in the Cocoon but I can say that this layer responds pretty slowly to pressure and I experienced a little bit of sinkage, which we’ll take a look at later in the review. when lying on the mattress. In the Soft version of this mattress the memory foam layer is immediately followed by a 2” poly foam layer. That layer is meant to act as a transition from the soft memory foam to the high density base layer, which would allow the sleeper to sink into the mattress a bit more and provide some pressure relief. Base Layer – The Cocoon Firm has an 8” high density poly foam base. This layer is meant to support the sleeper, give the mattress its shape and act as the foundation for the construction as whole. By transitioning directly from the memory foam comfort layer to the base layer, the sleeper will have greater interaction with the support components of the Cocoon, creating a firmer feel overall. In the Cocoon Soft the base layer is 6” of the same high density foam. By reducing the size of the base layer and replacing 2 inches of the high density foam with transition poly foam, Sealy moves it further from the sleeping surface, creating a softer feel. Everybody feels the firmness of a mattress differently, due to differences in body type and size. Instead of just taking my word for it, I brought in three more testers to give their opinion on the firmness level as well. This should give you a better sense of the firmness range you can expect out of the firm version of the Cocoon by Sealy. 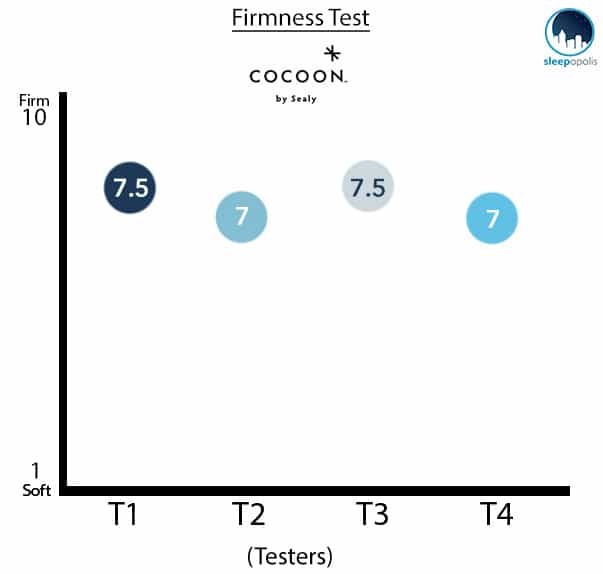 Firmness rating of Cocoon by Sealy from 4 testers. As you can see on the chart above all testers had a similar feel for the Cocoon Firm as it came in with a 7-7.5 on the firmness scale. In general, when discussing other mattresses, we consider a medium firmness to be more in the 6/10 range, so the Cocoon Firm is living up to its name here. When I pressed into the memory foam it had an initial firmness to it before beginning to contour. I felt myself sinking into the mattress slightly but the quick transition to the base layer kept me from getting stuck. The short top layer also means that I am able to adjust my position on the mattress pretty easily. Lastly the high density base layer provided me with good support. To go along with my description of the feel of the mattress I also wanted to provide you with a visual representation of where you may feel increased pressure while on the Cocoon. To do this, I placed a pressure map on top of the mattress and lied on my back, side, and stomach. You can see the results of the test on the image below, with pressure represented from blue (low pressure) to red (high pressure). When lying on my back, my weight is pretty evenly distributed and you can see that this causes low pressure across my entire body. The mattress did a good job of filling in the space beneath my lower back, which is important for back sleepers as they will want lumbar support in this position. The Cocoon did a good job of keeping my spine aligned in this position, which should help defend against waking up with aches and pains in the lower back. Once onto my side the results show increased pressure at my hips and shoulders. This is to be expected on a firmer mattress as there is a higher concentration of weight in this position. Strict side sleepers tend to prefer softer mattresses as they allow the shoulders and hips to sink in a bit more for greater pressure relief. If you do sleep on your side you may want to take a look at the softer version of the Cocoon. Rolling onto my stomach we again see fairly low pressure across my entire body. In this position I felt that the Cocoon did a good job of keeping my hips from sinking into the mattress, which would put more strain on my lower back. Stomach sleepers, like me, tend to prefer firmer mattresses as they keep our back in a good position and keep pressure off the chest, which makes breathing a bit easier. I found that the Cocoon Firm lived up to its name here and kept my spine aligned so that I wouldn’t develop aches in my back while sleeping. If you share your bed with a partner you will want to know how well a mattress can isolate motion. To test this we set up our Motion Transfer Test, which is meant to simulate someone tossing and turning at night or getting into and out of bed. 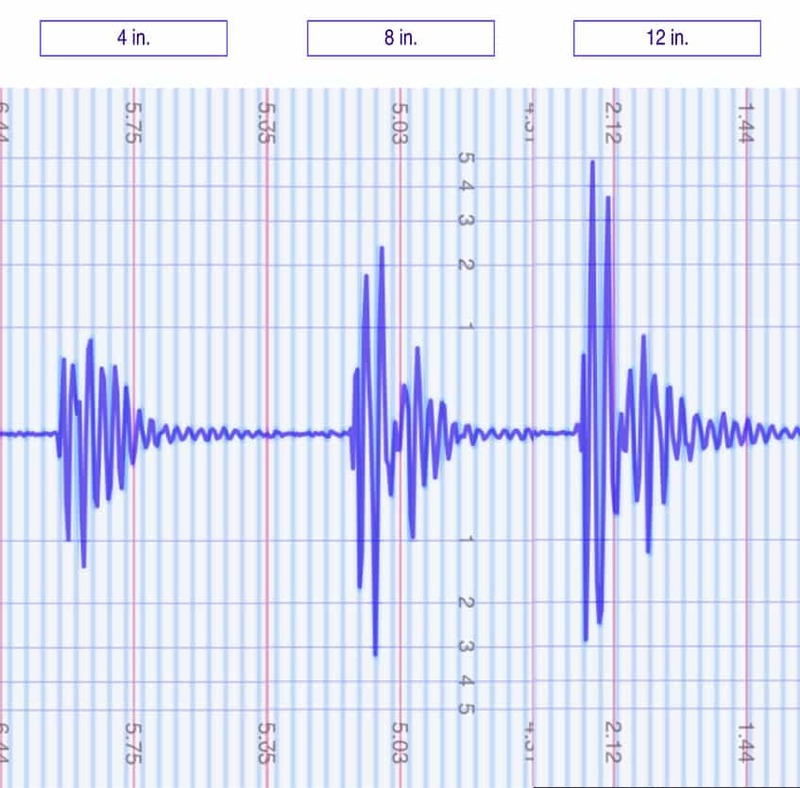 The results should be helpful in showing the intensity of disturbance that is detectable on one side of the mattress when there is motion on the other. The 4 inch drop is to simulate someone tossing and turning at night, and you can see that the disturbance from the ball drop doesn’t spike too high. Memory foam has good motion isolation attributes and the Cocoon handles the 4 inch drop pretty well. The 8 and 12 inch drops simulates someone getting, or jumping, into bed and show larger spikes in disturbance as the ball gets through the memory foam and interacts with the high density poly foam base. With the firmer base layer just below the memory foam I am not surprised to see a jump in the amount of motion detectable across the mattress. I would expect the Cocoon Soft to perform slightly better on motion transfer as it has the poly foam transition layer between the memory foam and base. Depending on personal preference, many people will want to know if they are going to lie on top of or sink into a mattress. To get a better idea on how far into the Cocoon someone can expect to sink I used four balls of varying sizes and densities (a 6 lb medicine ball, an 8 lb medicine ball, a 10 lb steel ball, and a 50 lb medicine ball) and placed them on the mattress to measure how much they compress the surface. 50 pound medicine ball: A little less than 4 inches of sinkage. If you share your bed and need to use the entire surface area of the mattress, then edge support is going to be important to you. It is important for a mattresses to feel even support near the side so that you feel secure and don’t have to worry about rolling out of bed. Foam mattresses sometimes struggle to live up to the edge support of traditional innerspring mattresses, so I wanted to test to see how I would feel near the side of the Cocoon. When lying near the side of the cocoon I felt pretty evenly supported from the center of the mattress to the side. I also changed my position and rolled around a bit and felt secure that I wouldn’t cause the side to collapse. When hanging off the side of the mattress I did start to see some compression, which isn’t out of the ordinary for a foam mattress. 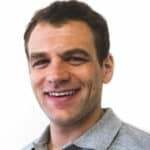 In this position, think putting your shoes on in the morning or getting into bed at night, my weight is concentrated on one area of the edge of the mattress and I saw a good amount of compression. It may not be the most important position to consider when purchasing a foam mattress but I wanted to give a visual for what kind of compression you can expect when there is increased weight on the edge. There is a 100 night trial period for the Cocoon. Sealy offers a 10 year warranty on this mattress. Shipping is free within the USA and the Cocoon will arrive compressed in a box. Thinking about buying a Cocoon? Be sure to use the code SLEEPOPOLIS to save $100 on any Cocoon mattress! Now that we’ve gotten to know the Cocoon a bit, it’s time to talk about who this mattress would be a good fit for.Is the Cocoon by Sealy right for you? No frills mattress – The Cocoon uses basic design, pairing a memory foam comfort layer with a high density base layer, to create a firm feel for the sleeper. If you want the classic memory foam feel, but your sleeping preferences aren’t too specific, this could be a good fit. Short term solution – Maybe you’re child is leaving home for the first time or you’re moving to a new city, but aren’t quite ready to set down roots, the Cocoon could be an affordable plan for the transition period. Stomach sleeper (firm option) – This point is specific to the Cocoon Firm version as it did a good job of keeping my hips from sinking into the mattress and my spine aligned. Side sleeper (soft option) – If you are a strict side sleeper that is interested in purchasing the Cocoon by Sealy I would recommend choosing the soft version. The added transition layer allows the sleeper to sink further into the mattress and providing greater pressure relief than its firmer counterpart. Need more information or are you ready to buy? Visit Visit CocoonbySealy.com. The Cocoon by Sealy is the first mattress developed by one of the big mattress companies to begin to gain sizable popularity. The mattress uses a memory foam top layer with poly foam transitional and support layers to create a feel that’s balanced in its level of sinkage, but still achieves a memory foam hug, contour, and feel. The ability to select soft (more of a medium really) or firm feels alongside a standard or cooling cover are also nice extras. Overall, a very solid mattress.